Faint memories swirl about my brain as I recall the Super Mario World cartoon. It all seems vaguely familiar in my list of Saturday morning cartoons I can remember, but there is something blocking the memory for the show from being vivid like the ones I have for Animaniacs, X-Men, and Batman. Upon reviewing the video below, I can understand why: it was absolutely horrible. In this episode, Mario has to teach cavemen(?!) teamwork, and the best way he can come up with imparting this knowledge is American football. Two of the Koopalings spy on the proceedings, and then Kamek turns Luigi into an egg. Mario and Yoshi must then play the Koopas in a game of football using Luigi the egg as the ball. The cavemen, who apparently live on Yoshi’s Island, come to save the day using teamwork! A couple of things in the show may exist in the Mario World world, but brought into animation just do not feel right or good or just. The first and worst: Yoshi speaking English. Yoshi, on occasion, spurts a few lines of English in text bubbles, but hearing it makes you cringe, like a demon scraping its fingernails over your eardrums. 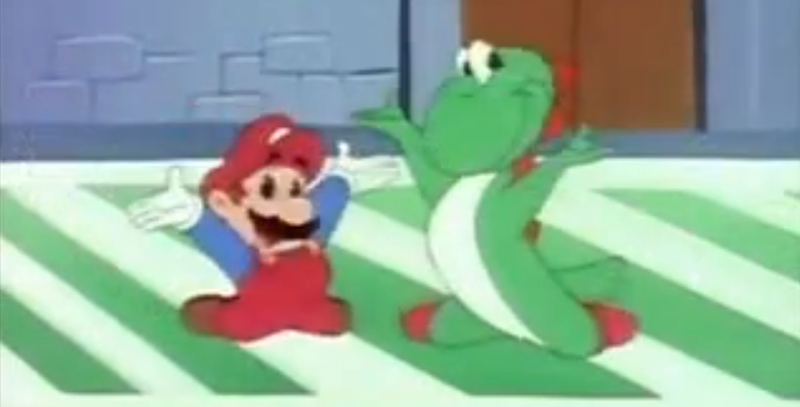 And nowhere in the games does Yoshi attempt to sing a song while doing an endzone dance. Woof. Too, the Chargin’ Chucks just don’t feel right, even though they are doing the exact thing you would expect them to do: play football. Somehow, them kicking footballs in a dank, lava filled cave makes more sense than them playing football proper, but probably because football proper doesn’t feel like it should exist in the Mario universe. That this cartoon is so terrible makes it easy to understand why its original run only lasted a couple of months and thirteen episodes.